Fun and Games! December brings gifts and time off from school. While it’s said, “Play is child’s work,” even grown-ups enjoy letting loose with games or play activities. The titles in this list explore several aspects of play, from pure fun to slightly sinister. Web links to additional information and activities about toys and play follow these reviews. It can be a little dangerous to be depressed in Mouse’s neck of the woods. When his merrymaking animal friends realize that he’s sad, they assume that something akin to extreme sports is in order. They throw him in the deep end (“Splash and paddle, wash and wade-Cheer up, Mouse!”), toss him in the air (“Leap and lope, hop and jump-Cheer up, Mouse!”), and, believing “Hearty grub is what he needs,” offer to stuff him full of, well, grubs. But Chipmunk, who’s been on the sidelines, realizes what Mouse really needs: a simple but heartfelt hug. Henry (I Speak Dinosaur!) creates a lush but smartly distilled woodland setting and expertly choreographs a large cast, which includes gloriously hued bluebirds, a handsomely striped frog with big yellow eyes, and a soft furry mole. The emotional pitch is just right: Mouse never looks mad or scared at his friends’ antics, which are clearly meant with the best of intentions. When that hug comes-an action that Henry beautifully unfolds over three spreads-it’s a great moment in the history of empathy. 2013, Houghton, Ages 4-8, $12.99. You have a lot of LEGO bricks, and you have already built the kits they came in, and you are looking for inspiration on what to build next. 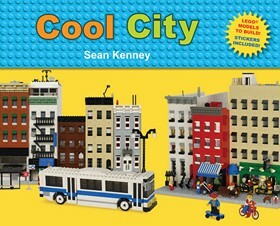 This book, by full-time professional Lego artist Sean Kenney, is an idea book for children and adults alike, especially those who have a hard time understanding that you can rip apart the spaceship you built following the directions and use the pieces to build something even more awesome. This book–along with Kenney’s Cool Cars and Trucks and Cool Robots–gives ideas for building city scenes, with tips for making subway stations, rows of townhouses, a deli, and a four-story apartment building with a working elevator. The text is written in simple language that will be good for young children who are just starting out with LEGO bricks, or even the very young builders who are still at the Duplo stage. The suggested models range from about an eight-years-old’s ability up. Includes a sheet of 50 city-themed stickers for attaching to bricks (e.g. one that looks like a Chinese restaurant’s neon sign; street signs; subway signs). 2011, Christy Ottaviano Books/Henry Holt and Company/Macmillan, Ages 5 up, $12.99. REVIEWER: Sara Lorimer (Children’s Literature). In order to protect the family fortune, seventeen-year-old Katharine Tulman is sent to her Uncle’s Victorian estate to prove that he is insane. When she arrives, she encounters a motley group, including the stern housekeeper Mrs. Jefferies, the brooding apprentice Lane, and the mute boy Davy who carries a rabbit everywhere. She discovers that her eccentric Uncle has created an entire, self-sufficient village, with 300 people rescued from the London workhouses. The estate has even fashioned its own gasworks in order to support her child-like Uncle’s “playtimes,” where he creates fantastic toys like a spinning dragon, lifelike recreations of people, and a fish that holds its course and depth. Katharine must decide whether to reveal her Uncle’s odd behavior or save the lives of everyone in the village. Along the way, she falls in love, has fun, and may be having a change of heart, but how will she secure her own financial future? What is more, she has started having inexplicable fits, memory loss, and dangerous night-time wanderings that may just mean she is going crazy herself. Altogether, Cameron’s debut novel is as well-crafted and mysterious as one of the automata toys found within its pages. The conflict becomes increasingly layered while the tension-filled pages refuse to drag. Within Cameron’s expert use of language, the setting and characters truly shine. Furthermore, the mystery’s clues are not too telegraphed and the book’s ending ties everything together magically in gratifying and unexpected ways. Wuthering Heights meets steampunk, this story is satisfying to the last page and is sure to leave teen readers eager for a sequel. 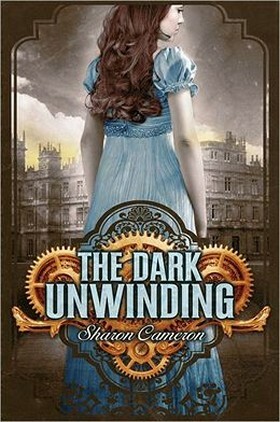 Highly recommended for both teens and adults, Cameron’s book is a real treat for anyone interested in Victorian England, mysteries, romance, gothic stories, oddities, subterfuge, steampunk, or just an all around excellent read. 2012, Scholastic, Ages 12 up, $17.99. REVIEWER: Jennifer Greene (Children’s Literature). REVIEWER: Ken Marantz and Sylvia Marantz (Children’s Literature). A young boy, buried for eight days after the earthquake in Haiti, tells how he managed to pass those fearful days by imagining times with his friends and family as he recalls they were before the catastrophe. On the first two days he plays marbles and hide and seek in his mind with his friend Oscar and others. The third day he spends with his family. On the fourth, he imagines singing a solo with the children’s choir, “,,,the best solo ever sung ” He cries on the fifth day because Oscar goes to sleep after a game of soccer but never wakes up. He goes to the country with his sister on the sixth day, and rides bicycles with her around the town on the seventh. He joyously celebrates his reunion with his parents on the eighth day. 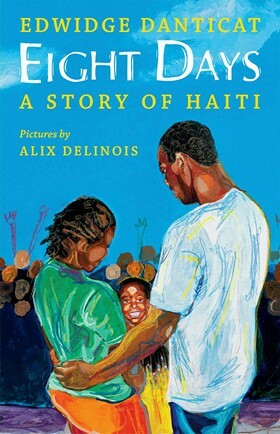 The simple but moving text also celebrates Haiti and its children. Delinois’s double-page scenes in acrylics, pastel crayons and collage, have sculptural qualities that seem to express the spiritual strength of the trapped boy. Characters, objects, and contextual details are created with vigorous applications of color. Check the contrasting beginning and end pages. A note from the author adds background information. 2010, Orchard Books, Ages 5 to 8, $17.99. Librarians and English teachers will happily recommend this adventurous romp from Grabenstein (the Riley Mack books), which pays playful homage to books and libraries while engaging readers in a fast-paced competition involving research and reasoning skills. Twelve seventh-graders win a chance to spend an overnight lock-in previewing their town’s new public library-it’s a marvel of technological delights conceived by Luigi Lemoncello, the Willy Wonkalike founder of Mr. Lemoncello’s Imagination Factory, which is a source for every kind of game imaginable. During the lock-in the winners, who include game-lover Kyle Keeley and a group of multicultural classmates with a mix of aptitudes and interests, are offered a further challenge: “Find your way out of the library using only what’s in the library.” The winner will become spokesperson for the Imag-ination Factory. Book lovers will relish the lavish sprinkling of book titles and references while puzzle fans will enjoy figuring out the clues. A lighthearted parody of reality survival shows, the book reinvigorates the debate over the Dewey Decimal system and traditional library skills while celebrating teamwork, perseverance, and clever wits. 2013, Random House, Ages 9-12, $19.99 and $16.99. REVIEWER: Publishers Weekly (Publishers Weekly). 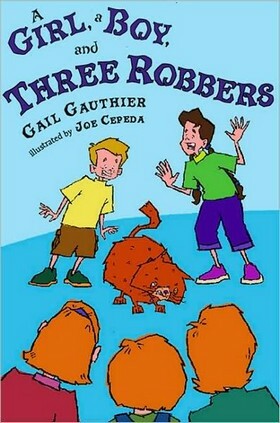 Gail Gauthier’s A Girl, A Boy, and Three Robbers provides elementary grades with the story of Brandon, who would rather watch TV than participate in the crazy games his friend Hannah makes up – until neighbors attempt to steal Hannah’s cat and a real-world quest evolves. 2008, Penguin Readers Group, Grades 2-4, $14.99. REVIEWER: Midwest Book Review (Children’s Bookwatch). Go Out and Play! 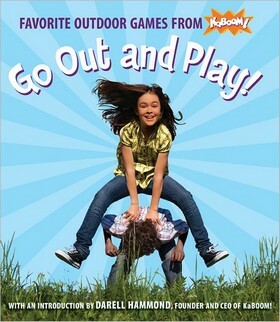 : Favorite Outdoor Games From Kaboom! Children have played tag for years–but they can up the ante by playing pickpocket tag. Soccer has its place–but crab soccer makes everyone collapse in laughter. Even cleaning the room can be fun–as long as the “room” is marked off outside, split in the middle by a net, and turned into an arena of frantic ball exchange. In this delightful book addressing the rules of the outdoor games we grew up with, the nonprofit organization KaBOOM! effectively addresses the age-old complaint, “I’m bored!” Darell Hammond, Founder and CEO of KaBOOM!, explains the need behind outdoor play: it encourages fitness, creativity, success in school, and the ability to play well with others. In addition, children who play outdoors are generally happier. While the beginning of the book relates how parents can facilitate play, the ending advises them on how best they can get communities involved. From games with rules–with intriguing names like Blob, Baby in the Air, and What Time Is It, Mr. Wolf?–to no-rules games, the point is clear: go out and play! 2012, KaBOOM!/Candlewick, $11.99. Ages adult. REVIEWER: Bonita Herold (Children’s Literature). Jack lives in Hokey Pokey, a wonderland where kids play all day and there are no grown-ups to interfere. Being one of the Big Kids, Jack is looked upon as a leader and enjoys his carefree life immensely–that is, until the day his bicycle, Scramjet, is stolen by Jubilee, someone who has always been avoided because she is a girl. Jack now senses things are becoming askew and is concerned about a train whistle that only he can hear in the distance, as everyone knows in Hokey Pokey there are no trains, only tracks. During the 1950s, when Spinelli was growing up in Norristown, Pennsylvania, there was a shaved-ice vendor who walked up and down the town streets pushing a cart loaded with a block of ice that he would scrape, put into a paper cone, and drizzle with flavored syrup. In an interview on aroundmainline.com, Spinelli shares that this salesman was always referred to as the “Hokey Pokey Man,” and he became quite iconic in Norristown. This treasured childhood memory helped inspire Hokey Pokey, another inventive and compassionate story from the Newbery Medal winner, which explores childhood as a place as well as a period of time. Spinelli’s poignant story of leaving childhood behind and growing into the unknowns of adolescence is cleverly approached and lyrical in presentation. This is essential for all public and school libraries. VOYA CODES: 5Q 4P M (Hard to imagine it being any better written; Broad general YA appeal) 2013, Knopf, Ages 11 to 14, $15.99. REVIEWER: Elaine Gass Hirsch (VOYA). I Love my New Toy! Elephant and Piggie are good friends. Piggie gets a wonderful new toy and shows it to Elephant, who is not quite sure what the toy is. Actually, Piggie doesn’t know what the toy is either. After deciding that it must be a throwing toy, Elephant gives it a nice toss into the air. The friends watch it come back down to earth, where it breaks. Both friends are horrified, and Piggie gets mad. Elephant apologizes, Piggie stays mad, and both friends cry. As all hope seems lost, a squirrel comes over and wants to play with the break-and-snap toy. Piggie tries breaking and snapping her new toy over and over. Forgiven, Elephant declines to play with the new toy. He says that he would rather play with his friend than a toy. The friends abandon the toy and play tag together. 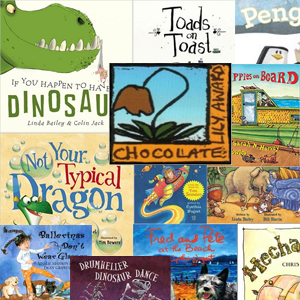 Children’s friendships are perfectly expressed in this series of early reader books. With careful word selections and pitch-perfect illustrations, Willems captures the lightning fast shifts between humor and pathos in the world of young children. The illustrations are Willems’ characteristic style of line drawings in a limited color palette. His simple style belies the complexity of emotion and action his characters convey with their body language. Children will find much familiar in the plots, and Willems’ sly humor will delight. Elephant and Piggie stories are terrific for early readers, but they can also be enjoyed by younger children when read to them or by older children who will continue to enjoy Willems’ trademark humor. 2008, Disney Hyperion, Ages 3 to 7, $8.99. REVIEWER: Gwen Vanderhage (Children’s Literature). Boyd’s (I Love Grandma) wordless book features die-cut windows that readers can use to peer at small details on adjacent pages. The story’s greatest charm is in its portrait of a boy who lives alone and is constantly (yet tranquilly) busy. Clean gouache images painted on brown paper give the spreads a homemade feel. The opening scene shows the boy inside, busy at his table, preparing to start seeds in pots. Through the die-cut holes, snowmen the boy has built can be seen outside. The next spread is set outdoors; the boy plays in the snow, while a picture of a snowman that the boy has drawn is visible inside the house. Interior and exterior views alternate as the boy’s seeds sprout, and he finds a turtle in the spring rain. He gardens, makes sailboats, sails them in a little pool, then draws pictures of them, too. He’s full of ideas about new things to do, his animals and plants flourish, and the overall feeling is one of pervasive contentment. Many small incidents will sustain interest through multiple readings. 013, Chronicle, 40 pp., $15.99.Ages 3-5. Becker takes us on an enchanting wordless journey. A young girl contemplates her bright red scooter on the steps of her monochromatic house in the monochromatic city where her mother, father, and sister are otherwise occupied, too busy for her. Spying a red crayon on her floor, she draws herself a bright red door through which she enters a lantern-lit lush green forest. Her crayon produces a red boat to sail down a river to a magical city. Drawing a red balloon takes her from danger up to the sky and to an incredible flying machine. There she sets a captured purple bird free and is on to more adventure on a red flying carpet, following the bird to an amazing happy ending. The detailed naturalistic scenes are produced with pen-and-ink and muted watercolors; only the vehicles that carry the young adventurer to a fairy tale world are crimson, while some roofs are golden or blue. Small, faint drawings of different vehicles fill the red end pages. On the jacket, our heroine approaches a stone castle in her red boat, while the black cover is decorated only with a blind stamped hot air balloon. 2013, Candlewick, Ages 4 to 8, $15.99. Lulu, the self-proclaimed, superhero, Ladybug Girl, feels left out when her mother and father have to work and her brother refuses to include her in his plans to play baseball with his friends. When Lulu asks her brother why she cannot play with them, he simply explains that she is too little. Left alone with her dog Bingo, Lulu searches for something to occupy her time in her house, which is full of books that she cannot read and plants that are growing too slowly. Finally, she and Bingo go outside, and Lulu discovers a bunch of ants climbing a rock. Lulu says, “Is that rock in your way, ants? It’s much too big for you to move, isn’t it? I can help you! 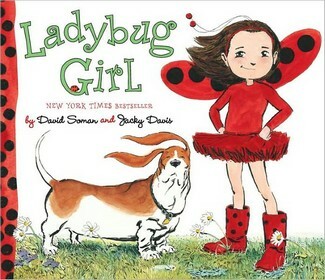 I’m Ladybug Girl!” Lifting the rocks for the ants transforms Lulu into a true superhero, and Ladybug Girl gains the confidence she needs to overcome fears, reach personal goals, and gain a new perspective. The whimsical, clever, and playful illustrations add flair and personality to a piece that inspires children of all ages to realize and reflect on their own self-worth. 2008, Dial Books for Young Readers, Ages 5 up, $16.99. REVIEWER: Jamaica Johnson Conner (Children’s Literature). In the opening spread Maisy is hard at work painting a picture. She has a paint brush (el pincel), an easel (el caballete), and wears a smock (el guardapolvo). Other toys are featured on the following pages–a doll, blocks, a tricycle, ball, toy train, teddy bear, toy car, and more. Maisy, like many children in middle class families, has quite a variety of toys. Simple words and illustrations will help children learn Spanish and English words and also offer an opportunity for interaction in bilingual families. The one drawback in this series is the lack of pronunciation guidance. 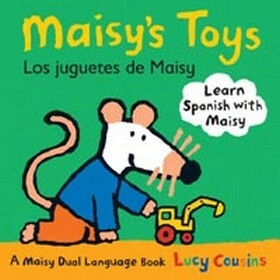 “A Maisy Dual-language Book.” 2009, Candlewick Press, Ages 18 mo. to 3, $5.99. REVIEWER: Marilyn Courtot (Children’s Literature). 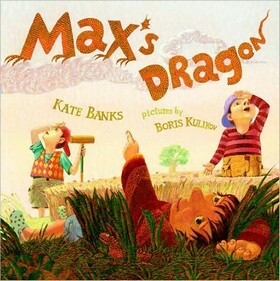 While playing a game of croquet, Max cleverly creates a rhyming journey as he and his friends imagine dragons and dinosaurs. The wonderful illustrations throughout the book are filled with rich, warm colors. 2008, Frances Foster, Ages 7 to 11, $16.95. REVIEWER: Darla Taylor (The Lorgnette – Heart of Texas Reviews). 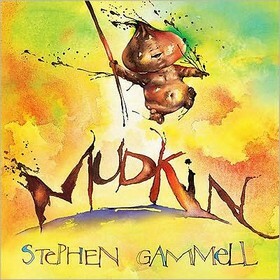 Sure, rain showers bring flowers, but they also bring plenty of mud-the star of Gammell’s (How the Nobble Was Finally Found) exuberant picture book romp. Post-rain, a girl heads out to play, queen of her stuffed animals and all that she surveys. When a mud creature with a turnip-shaped head splashes up out of a puddle, the girl gains a new pal and a new subject who provides her with a grand robe, crown, carriage, and even a castle, all made out of the brown muck. As another thunderstorm blows in, Mudkin and his fantastic kingdom wash away-leaving only the girl’s crown. In this nearly wordless volume, readers see Mudkin’s communiqués as splotches of mud, while the girl’s speech is one side of a conversation that makes perfect sense to her. (“Hi… what’s your name?” “Mudkin… it’s nice to meet you”). Gammell’s signature style-wispy, loose lines with paint splatter accents-flows freely like a muddy daydream over the spreads. No doubt that kids will be checking puddles for impish, fun-loving Mudkins of their own come spring. 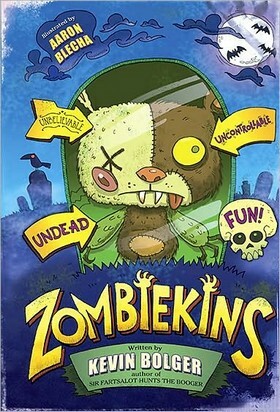 2011, Carolrhoda Books, Ages 5-8, $16.95. Sprightly rhyming couplets advance a simple story of children at play in a park when it begins to rain. “See the breeze / toss the trees. / Plip, plop. / Drip, drop.” The kids make the most of watery opportunity, jumping in puddles and finding things that float, until “Flash! Boom!” Thunder and lightning send everyone rushing for the car. “Wipers swish. / Sneakers squish” as they head for the snug comfort of home. Javaka Steptoe’s beautiful, textured collage illustrations show a jubilant and wet! 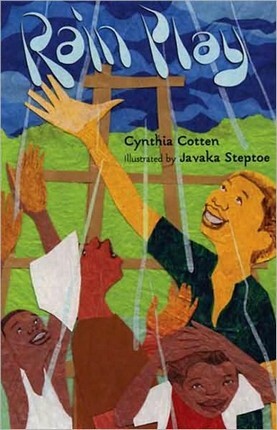 group of African American children and a dad engaged in the “rain play” that Cynthia Cotten’s lively narrative describes. 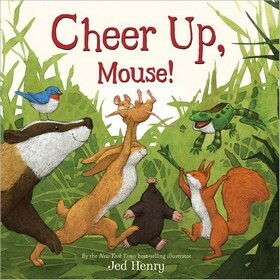 2008, Henry Holt, Ages 3-6, $16.95. REVIEWER: CCBC (Cooperative Children’s Book Center Choices, 2009). A meaty, intricately plotted gothic novel about two orphans, Lizzie Rose and Parsefall, who are apprenticed to a gifted puppeteer named Grisini. Grisini is also an evil magician, and after the trio gives a private performance at the birthday party of a lonely rich girl named Clara Wintermute, Clara disappears. Not long after, Lizzie Rose and Parsefall discover Grisini has a new puppet and recognize it as the missing girl. Meanwhile, in northern England, a dying witch is in agony due to a powerful stone in her possession her only relief will come if a child steals the stone. The witch has chosen the apprentices of her long-time adversary Grisini as the most likely thieves. Laura Amy Schlitz’s ominous tale unfolds from multiple points of view the three children, the magician, and the witch so that only readers see all the pieces of the puzzle, but finding out just how all those pieces fit together will keep them turning pages. Schlitz builds tension as her characters especially the three children who’ve been dealt such different fates and who each own a different kind of sadness face the challenge of temptations and the dangers of deceit. A story that starts out deliciously sinister draws to a perfect and perfectly happy conclusion. 2012, Candlewick, Ages 8-11, $17.99. 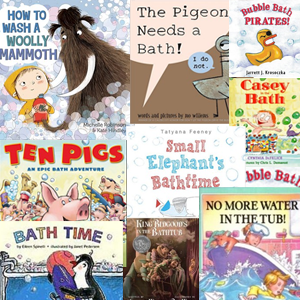 REVIEWERS: CCBC (Cooperative Children’s Book Center Choices, 2013). 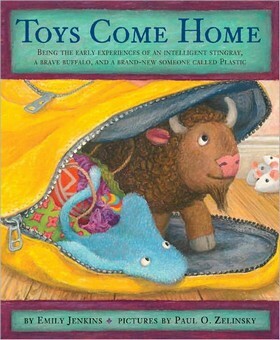 A prequel to Toys Go Out (Schwartz & Wade, 2006) and Toy Dance Party (Schwartz & Wade, 2008), Toys Come Home will engage readers new to the story, as well as those for whom StingRay, Lumphy, and Plastic are familiar friends. Plush toy StingRay arrives at the Girl’s house as a birthday gift. Her earliest days are like those of any newcomer: She must figure out where she fits in and gain understanding of the rules that govern behavior. Rebuffed by attempts to befriend authoritative walrus Bobby Dot, ancient and narcoleptic Sheep, and the tight-knit community of toy mice, unhappy StingRay resolves to run away. She only makes it as far as the basement, and when she’s greeted upon her return by an affectionate Girl, StingRay realizes she’s found what was missing: “Somebody to love. Somebody who will love her back.” As in the previous books, each chapter covers an episode in toy life at the Girl’s house. StingRay settles into her new home, jockeying with Bobby Dot for favorite toy status and enduring the indignity of a particularly rambunctious play date. A case of the stomach flu triggers upheaval among the toy population when a vomit-covered Bobby Dot doesn’t survive a trip through the dryer. Lumphy the Buffalo makes his entrance, followed soon after by Plastic, and the stage is set for a memorable friendship among three little toys with big personalities. Short chapter lengths and occasional full-page illustrations contribute to the appeal of a book that begs to be read aloud. 2011, Schwartz & Wade, Ages 6-8, younger for reading aloud, $16.99. REVIEWER: CCBC (Cooperative Children’s Book Center Choices, 2012). Fans of the first book will be thrilled to discover this new adventure “brought to you by the power of GERMO” and the remarkable imagination of Mini Grey. After an adventurous day of play for Traction Man and his faithful pet Scrubbing Brush that included climbing the compost heap and falling into the mud, the little boy takes his toys inside. While he is asleep on the sofa, his parents throw Scrubbing Brush into the garbage bin. They leave a new toy: the battery-operated, robotic Turbodog, which always seems to talk at the wrong time. Traction Man goes in search of Scrubbing Brush. Wearing the appropriate attire and armed with a bottle of Super Strong GERMO with ammonia, he goes into the Bin. 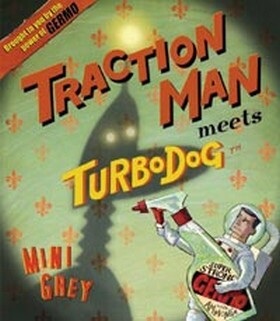 “No one has ever returned alive from the Bin before.” But this is Traction Man! Full of tongue-in-cheek humor, a subtle lesson about the power of imaginative play, and expressive illustrations that are a perfect match with the story, readers will return over and over again. Just as Traction Man and Scrubbing Brush are poised for their next rousing adventure at the end of this book, so, too, the reader eagerly awaits. 2008, Alfred A Knopf, Ages 4 to 8, $16.99. REVIEWER: Sharon Salluzzo (Children’s Literature). Lehman has once again produced a delightful and imaginative wordless picture book; this one stars a young girl who disembarks from her train and steps into a Lilliputian land where she helps some stranded folk. Returning to the train, she leaves the colorful countryside to return to the drab city with her parents. But her adventure is not over yet, when she arrives home, she gets a surprise visit from her new wee friends. The illustrations are bold with thick, heavy outlines, and the story unfolds in successive frames–some small, others whole page or two-page spreads. 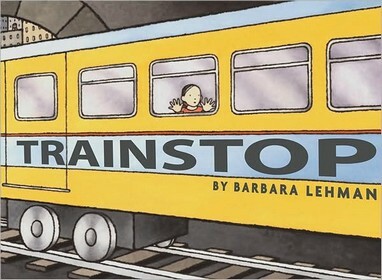 Trainstop is a worthy addition to Lehman’s previous works with more leeway for the imagination than Rainstorm (Houghton Mifflin, 2007). This book is somewhat whimsical in plot, but solid in entertainment. Trainstop is a particularly good choice for a classroom collection for young children to inspire oral or written storytelling; it would work well along side Wiesner’s Sector 7 (Clarion, 1999) as a look at how imagination can transform the mundane into an adventure. Rating: Outstanding. 2008, Houghton Mifflin, all ages, $16.00. REVIEWER: Kate Reynolds (Childrens Book and Play Review). A yard sale at Widow Imavitch’s spooky old house is not an event to be missed. Still, Stanley and Miranda are kind of disappointed in her wares, at least until Stanley finds a creepy-cute stuffed toy called Zombiekins still in its box. Mostly teddy bear, it has one bunny ear, lizard feet, clawed and webbed paws, and fangs, but most importantly, it comes with instructions that Stanley ignores despite Widow Imavitch’s warnings. Later that night, a ray of moonlight animates the undead toy, and the gruesome hilarity begins. Soon, Stanley’s school is overrun by zombies, and he and Miranda have to figure out how to stop the toy and reverse its effects before it’s too late. Offering a thoroughly accessible introduction to verbal, situational, and dramatic irony, this generously illustrated chapter book mines multiple veins of humor, from witty turns of phrase and metafictional intrusions, send-ups of conventional story expectations, surprise reversals, horror-genre allusions, and physical slapstick to good, old-fashioned grossout fare; certainly, it’s a contemporary riff on Dahl, but it’s perhaps even funnier. The zany line-art caricatures sometimes support the text directly but more often stand in hilarious ironic counterpoint to the words. Plot pacing is perfect, with richly detailed escalation that offers plenty of time for wacky character humor in the school setting and a quick denouement that opens the possibility for a sequel, which readers will certainly welcome Review Code: R — Recommended. 2010, Razorbill, Grades 3-6, $10.99. REVIEWER: Karen Coats (The Bulletin of the Center for Children’s Books). To stay up to date on new books on this topic, consider subscribing to The Children’s Literature Comprehensive Database. For your free trial, click here. If you’re interested in reviewing children’s and young adult books, then send a resume and writing sample to emily@childrenslit.com.